It’s October which is synonymous with National Breast Cancer Awareness. We’ve discussed Pinkwashing here before (Pinkwashing: A Growing Concern) and this time, chemist and industry expert, David Pollock, is releasing a warning regarding “pinkwashing” practices common in the beauty industry. 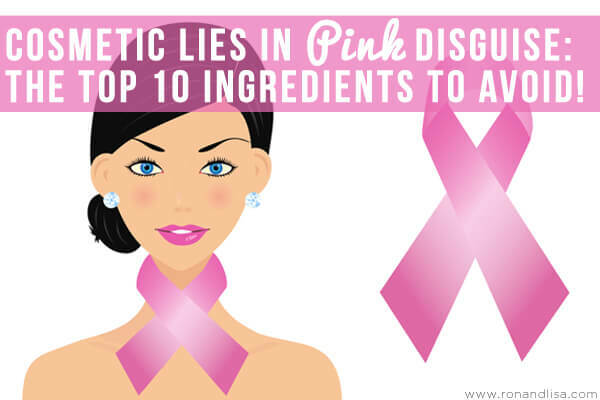 The term pinkwashing refers to the sale of items that contain ingredients that are known carcinogens, while marketing these products in support of breast cancer awareness. While these companies generally do indeed practice fundraising according to their marketing statements, they may actually be contributing to the development of this disease with the product itself. 2. PEG’s & GLYCOLS—including Polyethylene Glycol (PEG), Butylene Glycol, Propylene Glycol, etc. 7. TRIEHTANOLAMINE—often listed as TEA. Can react with other chemicals in cosmetics to form carcinogenic nitrosamines. Additional information regarding David Pollock’s advice for “Safe Beauty” can be found in his book Just Stop the Lies: Secrets the Beauty Industry Doesn’t Want You to Know. Guest blogger, David Pollock, is a beauty innovation veteran with more than 20 years of experience formulating products for some of the most recognized names in the industry. He has been honored by Global Cosmetics in their roster of “20 To Know.” He is a published author and an experienced radio guest speaker—reaching more than 16 million listeners and countless more via his regular contributions to online publications, such as Yahoo.com, Dr. Oz and Oprah’s ShareCare.com, DrLaura.com, Wellness.com, and his own “Beauty Inside Out—With David Pollock” on RadioMD and online publication JustAskDavid.com. Thank you so much. I hate synthetic fragrance. It’s way to strong. I know it’s totally unhealthy. I think it’s almost impossible to avoid these today without buying organic products or making your own. Yes, synthetic fragrance should be avoided at all costs. 75% of products that contain it also contain phthalates (read more HERE) which are endocrine disruptors (ie: wreak havoc on the hormonal system). Here is a great post we think you’ll enjoy on fragrance (secrets the industry doesn’t want you to know: http://ronandlisa.com/2013/04/09/shhhh-secrets-revealed-fragrance-industry-doesnt/ and what you can do about it)! Absolutely :) It is so true what you say about water – everything (including pharmaceuticals flushed down the toilet) end up back in our water supply. You can learn more about this in our prior post, ‘You’re Clean. Is Your Water? The Dirty Truth’ HERE. IMPORTANT: 1 in 8 women will be diagnosed with breast cancer, how much more awareness do we need? Our friends at the Breast Cancer Fund are working to shift the conversation from awareness to prevention. You can start by pledging to go beyond the pink to prevention. In just a generation we’ve witnessed a 40% increase in breast cancer, and we know that environmental factors like toxic chemical exposures have played a major role. Join the Breast Cancer Fund in pledging to go beyond the pink to prevention. Once you take the pledge, you’ll receive a toolkit full of information on how you can avoid toxic chemicals in your home and when you’re out shopping! Take the pledge NOW! When I use the cosmetics, shampoo, soaps etc. that have these ingredients I tend to break out. Also, they do animal testing on these products. What I want to know from these companies is that if animal testing is supposed to be for the protection, why do I end looking like a teenager with zit problems. When I use the kind that doesn’t have these ingredients (they don’t do animal testing) I don’t have issues with me skin. You can download an app for your phone or shopping guide to keep in your purse with you! Neither the U.S. Food and Drug Administration (FDA) nor the U.S. Consumer Product Safety Commission require animal testing for cosmetics or household products. There are sufficient existing safety data as well as in vitro alternatives to make animal testing for these products obsolete.